Adi Watches Military Man's Wrist Watch Golani Brigade IDF Infantry Brigade. The Golani Brigade (Hebrew: &###x5D7;&###x5B2;&###x5D8;&###x5B4;&###x5D9;&###x5D1;&###x5B7;&###x5EA; &###x5D2;&###x5BC;&###x5D5;&###x5B9;&###x5DC;&###x5B8;&###x5E0;&###x5B4;&###x5D9;&###x200E;, also known as the 1st Brigade) is an Israeli regular service infantry brigade that is subordinated to the 36th Division and traditionally associated with the Northern Command. It is one of the five regular service infantry brigades of the Israel Defense Forces (IDF). Its symbol is a green olive tree against a yellow background, with its soldiers wearing a brown beret. It is one of the most highly decorated infantry units in the IDF. The brigade consists of five battalions, including two which it kept from its inception (12th and 13th), one transferred from the Givati Brigade (51st), and two special forces battalions. 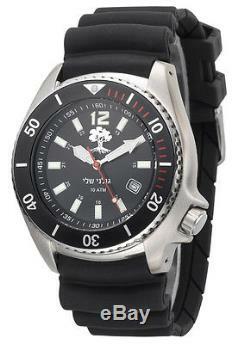 Adi Watches is an Israeli brand, located in the &###x201C;Kvutzat Yavneh&###x201D; kibbutz. The factory &###x2013; which was established in 1984 &###x2013; now produces more than 200 models of wristwatches for men, women, youth, children and soldiers. Adi Watches has long ago became a famous brand mostly known for its quality and durability. Over the years, Adi Watches has significantly expanded its activity to producing a wide line of sports, elegant, judaica and every day watches to comply with the requirement of both professional and Civilian segments. All products at Adi Watches are characterized by the utmost level of craftsmanship and design, and are produced from high quality materials such as stainless steel or titanium. This quality is field-proven on a daily basis, on the wrists of pilots, officers and soldiers in IDF special units. For orders of 50 or more watches, it is possible to add the private logo of any company or organization to your watch. We are committed to 100% satisfaction for our customers and to providing the highest level of service and trustworthiness. The Golani Brigade (Hebrew: &###x5D7;&###x5B2;&###x5D8;&###x5B4;&###x5D9;&###x5D1;&###x5B7;&###x5EA; &###x5D2;&###x5BC;&###x5D5;&###x5B9;&###x5DC;&###x5B8;&###x5E0;&###x5B4;&###x5D9;‎, also known as the 1st Brigade) is an Israeli regular service infantry brigade that is subordinated to the 36th Division and traditionally associated with the Northern Command. The factory – which was established in 1984 – now produces more than 200 models of wristwatches for men, women, youth, children and soldiers. The item "Adi Watches Military Man's Wrist Watch Golani Brigade IDF Infantry Brigade" is in sale since Sunday, January 29, 2017. This item is in the category "Jewelry & Watches\Watches, Parts & Accessories\Wristwatches". The seller is "giantsupersale" and is located in Ramat Ha Sharon. This item can be shipped worldwide.